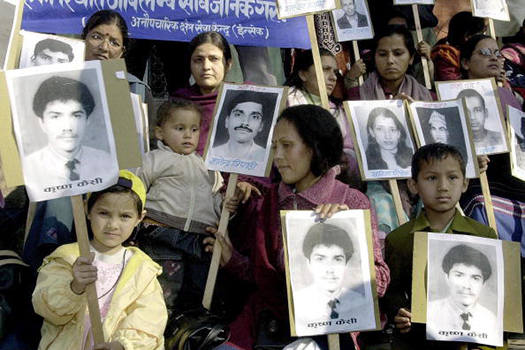 Ten Years After Peace, Is Nepal Finally Serious About Finding Its Disappeared? Since Nepal’s civil war came to an end a decade ago, the families of its 1,300 disappeared have been unwavering in their demands for the truth, for reparations and for accountability. In 2006, the government made formal commitments to provide exactly that. But what began as an affirmation of victims’ rights has given way to uncertainty and yielded little by way of results. Ten years of legal limbo later, victims’ demands linger in the political discourse, unanswered. A new government body began investigating the disappearances this spring, receiving a broad mandate to establish the truth about the missing. Critically, it presents an important opportunity to establish trust among victims who endured not only these horrendous crimes, but also a decade of politicking around their rights. However, as victims continue their ceaseless demand for justice – find them – they wonder: is the commission fully committed to addressing their needs? Nepal’s peace agreement was designed with these demands in mind. Signed in 2006, the Comprehensive Peace Accord (CPA) ended a bloody civil war between the government and Maoist forces that killed 13,000 and left hundreds more missing. Recognizing the pervasive use of enforced disappearances by both sides during the conflict, the CPA laid out steps to establish the truth and return victims’ remains to their families. It envisioned a government body, the Commission of Investigation on Enforced Disappeared Persons (CIEDP), to handle these needs. The plan stipulated by the CPA was quickly derailed by Nepal’s charged political landscape. In 2007, the government proposed a bill that would have created a body to investigate disappearances, but included clauses that would give commissioners the power to amnesty perpetrators. Years of political stalemate ensued, with victims’ rights at the center of political tug-of-war. The political power struggle came to a head in 2014, when parliament adopted the Truth and Reconciliation Act. Much like the 2007 bill, this new act finally established CIEDP anew, but also provided its partner body, the Truth and Reconciliation Commission (TRC), the ability to amnesty perpetrators. Such provisions were untenable to many victims, who were mistrustful of a commission with amnesty powers attached to it. It seemed as though victim concerns would be allayed in early 2015, when the Nepal Supreme Court ruled the amnesty provisions in the Truth and Reconciliation Act unconstitutional. However, the government pushed the CIEDP forward without amending the law in response to the court’s ruling, simply carrying on with amnesty text in place. Despite some attempts to amend the act, the amnesty provisions remain in place today. With the Supreme Court’s decision still unaddressed, parliament approved CIEDP’s regulations in March 2016 and set it to work. It is in this ambiguous context that CIEDP finally began work this spring, conducting its pilot phase of ante-mortem investigations in May. Ante-mortem investigations, or the compilation of information about the disappeared in an effort to find them, often involve interviews with family members or witnesses in order to piece together the truth. This means CIEDP heavily depends on relationships in victim communities. However, victims have mixed feelings about the commission, and cite the political posturing around amnesty as one reason for their uncertainty. They are unconvinced that CIEDP will be able to determine what happened to their loved ones, much less bring them justice. Despite her misgivings, Khadka participated in CIEDP’s pilot program this spring. She and others like her have worked with commissioners in the investigative process and many see it as an opportunity, however flawed, to tell the truth. And it is clear many victims want to support CIEDP’s work – but only if certain conditions are met. Ratna Ghimire, whose son was disappeared by state security forces, shares these concerns. Victims have worked across ideological lines to advocate for their disappeared loved ones, and speak out for the implementation of the Supreme Court’s decision. “I am not convinced that the commission’s present set-up will help the peace process in Nepal,” he says. This month, CIEDP closed complaint registration after a 4-month solicitation period in which they collected nearly 3,000 cases related to enforced disappearances. To sort through complaints, conduct further ante-mortem investigations, and identify the disappeared, the commission needs victims’ trust. To build that trust, victims say the state must meet their expectations when it comes to accountability, security and reparations. “The Commission would not be working in a victim-friendly environment due to legal provisions of the TRC Act,” says Dharma Chaudhary. Chaudhary’s brother was disappeared by state security forces during the civil war, and she was encouraged by the plan laid out in 2006’s peace agreement. She was even initially pleased that the CIEDP was set up to investigate. But now she thinks political interests supersede those of the victims. Victims want the government to operate with their interests in mind. That means the possibility that those behind their loved ones’ disappearances will face justice. CIEDP itself has made efforts to ensure that possibility. It has explicitly said that certain human rights violations falling within its mandate – including enforced disappearances – should be criminalized in Nepali law. However these recommendations have not significantly moved forward in Nepal’s legislative body. While victims say the potential for amnesty seriously damages CIEDP’s credibility, they add that the commission can restore much of its trust by fully committing to reparations for the families of the disappeared. In many cases, the disappeared was the sole breadwinner, leaving those left behind to suffer not only the emotional, but also the economic impact of the crime. While the government did establish an interim relief program designed to give $5,000 to victims in three installments, not all victims received that money. By committing to reparations more comprehensively, victims say CIEDP can win their trust. Victims and witnesses also have concerns about their safety if they participate in the commission’s investigations. The CIEDP does not have a witness protection mechanism attached to it, and the committees that manage victim complaints are not independent. The army – which still employs perpetrators of crimes during the civil war – has previously requested access to complaint records. This has left some would-be complainants hesitant to come forward. Khadka hails from the Bardiya region, home to the highest concentration of disappearances. She says that witnesses in her husband’s case are hesitant to testify because they fear for their safety. “I asked the witnesses and they told me that they don’t want to appear before the commission because of the security problems. The commission cannot assure the protection of witnesses,” she said. Ten years since the peace agreement ended the war, it remains unclear if the Nepali government has the political will to uncover the truth about those disappeared in the conflict. The ongoing posturing around amnesty provisions is one manifestation of the limited conviction to address the past. Another symptom: the CIEDP’s limited resources. The commission simply does not have enough funds or time to execute its mandate. One CIEDP member recently lamented the lack of resources allocated to the commission, and said that the scope of their work demands more time. The commission’s mandate expires in February, though it does have plans to work beyond that date. “We do not see a real political will to deal with the past,” El-Gantri concedes. Despite the CIEDP’s challenges and the country’s wavering political will, the commission has the potential to deliver the answers – and the justice- that victims have demanded for years. If it is to do so, though, the government must reaffirm the commitments it made in 2006 when it signed the peace agreement. That means adhering to the Supreme Court’s decision, acting on CIEDP’s recommendations to criminalize enforced disappearances and listening to the expectations of the families of the disappeared.